Theodore Fulton "Ted" Stevens (November 18, 1923 – August 9, 2010) is a former United States Senator from Alaska. He is a liberal Republican having a pro-abortion voting record. Among conservatives he is known as a "RINO" who has long favored more government spending, particularly for his own state. As the longest serving Republican in the Senate, Stevens served as President pro tempore of the United States Senate from January 3, 2003, to January 3, 2007. Stevens chaired the Senate Appropriations Committee from 1997 to 2005, except for the 18 months when Democrats controlled the chamber. The chairmanship gave Stevens considerable influence over fellow Senators, who relied on him for home-state project funds. Stevens had a six-decade career of public service, beginning with his service in World War II. In the 1950s, he held senior positions in the Interior and Justice departments during the Eisenhower administration. He has served continuously in the Senate since 1968, until his ouster in 2008. On July 29, 2008, Stevens was indicted on 7 felony counts related to making false statements in relation to a Justice Department investigation of business dealings in Alaska. Senator Arlen Specter expressed the disbelief and dismay felt by many in reaction to the bogus charges, "I've known Ted Stevens for 28 years and I've always known him to be impeccably honest. I don't know that there's a stronger comment to be made than that." According to Republican Senate caucus rules, Stevens resigned from his post as ranking member of the Senate Commerce, Science, and Transportation Committee. On October 27, Stevens was found guilty on all 7 counts of corruption. On April 1, 2009, the Justice department filed a motion to drop its case against Stevens. Attorney General Eric Holder decided to abandon the case due to prosecutorial misconduct. 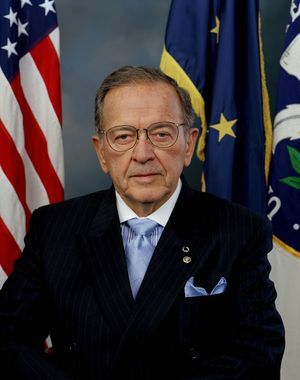 On August 9, 2010, Ted Stevens died in a small plane crash along with five others. This was not the first plane crash he had been in, in 1978 his first wife, Ann Mary, died in a plane crash that also left him with lasting injuries. Ted Stevens was born in Indianapolis, Indiana, in 1923. During World War II, he was an Army Air Forces C-47 pilot in the China-Burma-India theater with the "Flying Tigers" of the Fourteenth Air Force from 1943 to 1946, holding the rank of First Lieutenant. There he received two Distinguished Flying Crosses and two Air Medals, as well as the Yuan Hai medal awarded by the Republic of China. After the war, Stevens attended UCLA, where he was a member of Delta Kappa Epsilon, and Harvard Law School. In the early 1950s he moved to Alaska, then a territory. In Fairbanks, Stevens practiced law, and he was appointed U.S. Attorney for Fairbanks in 1953. In 1956, Stevens was transferred to Washington, D.C., where he worked as legislative counsel and assistant to Secretary of the Interior Fred Seaton. He also pushed for the statehood of Alaska and Hawaii, which occurred in 1959. In 1960, then-President Dwight D. Eisenhower promoted Stevens to solicitor of the Department of the Interior. After returning to Alaska, Stevens practiced law in Anchorage. He was elected to the Alaska House of Representatives in 1964, and became House majority leader in his second term. In December 1968, Governor Walter Joseph Hickel appointed Stevens to the U.S. Senate after the death of Democrat Bob Bartlett. In 1970, Stevens was elected to finish the term in a special election, and has been reelected six times since, in 1972, 1978, 1984, 1990, 1996 and 2002. Stevens served as the Assistant Republican Whip from 1977 to 1985. In 1994, Stevens was appointed Chairman of the Senate Rules Committee. Stevens became the Senate's president pro tempore when Republicans regained control of the chamber as a result of the 2002 mid-term elections, during which the previous most senior republican senator and former president pro tempore Strom Thurmond retired. He is a former Chairman of the Senate Governmental Affairs Committee and the powerful Senate Appropriations Committee. In the past, Stevens also has served as Chairman of the Senate Ethics Committee, the Arms Control Observer Group, and the Joint Committee on the Library of Congress. His campaign political action committee is called the "Northern Lights PAC." Ted Stevens was criticized when he attempted to earmark the "Bridge to Nowhere," a bridge in Alaska which would have connected the town of Ketchikan (population 8,900) with its airport on the island of Gravina (population 50) at a cost to federal taxpayers of $320 million, by way of three separate earmarks in a highway bill. A ferry service runs to the island, but some in the town complained about its wait (15 to 30 minutes) and fee ($6 per car). The Heritage Foundation maintained that "the Gravina Island bridge project is an embarrassment to the people of Alaska and the U.S. Congress...fiscally responsible Members of Congress should be eager to zero out its funding." In 2002, Stevens cosponsored a controversial bill called the Consumer Broadband and Digital Television Promotion Act (CBDTPA). Put forth by former Democratic Senator Fritz Hollings, if the bill had been passed, it would have forced all computer manufacturers to include inherent forms of copy protection. This was held unfavorably by open-source activists and developers, who often referred to Hollings using such titles as "The Disney Senator" and "Senator Mickey" due to his ties to the entertainment industry. This bill was never passed into law, though similar private efforts are occurring. In 2006, Stevens spoke before Congress in opposition to net neutrality. However, his speech was viewed as "rambling" and lacking basic knowledge of computers - for example, saying "an Internet" instead of "an e-mail message", claiming the Internet was not used for commercial purposes, and in a failed attempt to summarize technical definition of "pipe" - referred to the Internet as a "series of tubes". This became a major Internet meme. In the context of the debate Mr. Stevens was having, the comment is actually a salient point. The internet, as with all networks, cannot simply pile more data into its infrastructure indefinitely, as proponents of Net Neutrality insist. Like a pipe will burst under excessive pressure, so will the internet break down if ISPs are not allowed to manage their own traffic without interference. Senator Stevens may not be an expert on the Internet, but he understood that resources need to be responsibly used, not frittered away in the name of "neutrality." Stevens experience as a steward for Alaska's unique natural resources may play into his thinking here. In July 2008, Stevens was indicted on charges of taking gifts from the oil servicing company VECO and its CEO Bill Allen who benefited from his legislation. Stevens' son Ben, the leader of the state senate, and other state politicians have also been implicated in corruption related to VECO. On October 27, 2008, Stevens was convicted on seven counts of corruption, after a highly politicized trial that attempted to learn the extent of his dealings. Stevens, however, vowed to continue his bid. On November 18, Stevens' 85th birthday, the final vote tallies showed that Democrat Mark Begich had won the election by a narrow margin. Stevens' conviction was later overturned after U.S. Attorney General Eric Holder requested the presiding Judge to vacate the conviction because of prosecutorial misconduct. The prosecutor later committed suicide. ↑ Stevens' lifetime ACU rating is only 64.45, far lower than John McCain's rating of 82.16. Most conservatives rank over 90 on this rating.